Based on the novel by James Fenimore Cooper and the 1936 film by George B. Seitz and screenwriter Philip Dunne, The Last of the Mohicans is the story of two sisters who are accompanied by a major during the French and Indian War where they’re saved by a white Mohican warrior who accompanies them to a fort where their father is stationed at. Directed by Michael Mann and screenplay by Mann and Christopher Crowe from an adaptation by John L. Balderston, Paul Perez, and Daniel Moore, the film is a thrilling adventure film set during the French and Indian War in the Adirondack Mountains in the then-British colony of New York where a man tries to help two sisters reach their father while dealing with all sorts of foes. Starring Daniel Day-Lewis, Madeleine Stowe, Jodhi May, Russell Means, Wes Studi, Eric Schweig, and Steven Waddington. The Last of the Mohicans is an exhilarating and gripping film from Michael Mann. It’s 1757 during the French and Indian War between the British and American colonials against the French and various Native American factions where a trio of Native Americans save a major and two women following an ambush by Huron warriors on their way to a fort that is the home of the women’s officer father. It’s a film that play into three men who live a life of peace and generosity as they decide to help these two women to be with their father yet things would get complicated once they arrive at their destination during this conflict that is happening. The film’s screenplay by Michael Mann and Christopher Crowe that was also based on Philip Dunne’s screenplay for the 1936 film by George B. Seitz does play into the world that its protagonist Nathaniel Poe/Hawkeye (Daniel Day-Lewis) lives in with his adopted father Chingachgook and adopted brother Uncas (Eric Schweig) as they live to hunt and be good company to other colonial settlers. The first act is largely about Major Duncan Heyward (Steven Waddington) wanting to accompany his lover Cora Munro (Madeleine Stowe) and her younger sister Alice (Jodhi May) as their father Colonel Edmund Munro (Maurice Roeves) who is stationed at Fort William Henry. Major Heyward and his entourage is accompanied by the Huron warrior Magua (Wes Studi) unaware that he’s leading them an ambush by his own tribe as he has a hatred towards Colonel Munro over events from the past that related to his family. It would be Hawkeye and his family that would save the Munro sisters and Major Heyward where Cora isn’t sure about trusting Hawkeye yet realizes what is at stake. The film’s second act that takes place at Fort William Henry during a battle with the French army led by General Louis-Joseph de Montcalm (Patrice Chereau) where the Munro sisters learn that from their father that they weren’t supposed to come. The screenplay wouldn’t just play into this developing relationship between Hawkeye and Cora but also revelations that would plant the seeds of what is to come in this shaky alliance between the British forces and the colonial militia. After witnessing what happened to a family that Hawkeye and his family knew and Colonel Munro’s dismissal over the incidents due to lack of evidence. Cora realizes that even someone like her father is more concerned with maintaining his position rather than have the militia return to defend their home and families. The film’s third act which has everyone leaving the fort is about survival as well as the ideas of war where one group of people want to do what is honorable but another has personal reasons to wage war. Mann’s direction is definitely astonishing in terms of its visual presentation and intense approach to action. Shot on location largely on the Blue Ridge Mountains of North Carolina as well as various locations in the state as upstate New York and the Adirondack Mountains. Mann would use the locations as characters in the film as it play into a world that is peaceful only to be ravaged by war as it opens with Hawkeye and his family hunting and bringing food to eat and share with a family. The simplicity in Mann’s direction is key to the relationship Hawkeye would have with Cora later in the film with its usage of close-ups and medium shots as well as the brief moments between Alice and Uncas with the latter being protective of her from danger. The usage of hand-held cameras would play into the action as well as Hawkeye and his entourage trying to get to the fort and later hide from Magua and his tribe. Mann’s usage of the wide shots would play into the scope of the battle scenes as well as the attention to detail of the French digging trenches and getting closer to the fort as well as the distance of cannons firing toward their target. Mann’s usage of tracking and dolly shots add to the detail of the landscape and chaos of war while he would also aim for precise compositions to play into the suspense as it relates to Magua ambushing the British army. Mann knows when to break from the action and suspense as its climax where Hawkeye meets with the Huron sachem Ongewasgone (Dennis Banks) in a plea for peace and mercy despite Magua’s need for revenge. Mann would know when to keep things engaging but also play into the drama. Overall, Mann crafts a riveting and adventurous film about a white Mohican who help two British women and officer find safety during the French and Indian War. Cinematographer Dante Spinotti does phenomenal work with the film’s cinematography with its natural approach to lighting for many of the daytime exterior scenes as well as some scenes at night including one beautiful scene in a cave with the waterfalls and the usage of fire as it is a major highlight of the film. Editors Dov Hoenig and Arthur Schmidt do brilliant work with the editing as it has elements of style with its usage of slow-motion and rhythmic cuts as well as some other stylistic moments that play into the action, suspense, and drama. Production designer Wolf Kroeger, with set decorators Jim Erickson and James V. Kent plus art directors Robert Guerra and Richard Holland, does excellent work with the look of the homes of some of the characters as well as the interior of the fort and tents as well as the design of the Huron tribe camp. Costume designer Elsa Zamparelli does fantastic work with the costumes from the rugged look of Hawkeye and his family as well as the militia to the period dresses that Cora and Alice wear as well as the uniforms of the soldiers and officers from both the French and British. Special makeup effects/prosthetics designer Vincent J. Guastini does amazing work with the look of the Huron tribe through its makeup as well as their Mohawks and other hairstyles of the times. Sound designer Lon E. Bender does superb work with the sound in capturing the atmosphere of the locations as well as the sounds of guns and cannons that help play into the action and its impact. The film’s music by Trevor Jones and Randy Edelman is incredible for its bombastic music score with its usage of heavy percussions, woodwind arrangements, and other instruments that play into the drama and suspense while music supervisor David Kershenbaum would use a traditional Scottish piece performed by Dougie MacLean as one of the film’s music themes along with a piece performed by Clannad as it’s a highlight of the film. The casting by Bonnie Timmerman is wonderful as it feature some notable small roles from Jared Harris as British lieutenant early in the film talking with militia, Colm Meaney as an officer in Major Ambrose, Pete Postlethwaite as one of Colonel Munro’s officer in Captain Beams, Dennis Banks as the Huron sachem Ongewasgone, Tracey Ellis and Terry Kinney as a couple in the Camerons that Hawkeye and his family are friends with, and Patrice Cheraeau in a terrific performance as General Louis-Joseph de Montcalm as the French general who is a man of principle as he is also someone that cares about the rules of engagement and humanity as he tries to get Magua to honor these ideas of war. Maurice Roeves is superb as Colonel Edmund Munro as a British officer who is the father of Cora and Alice as he is dealing with being trapped as well as trying to maintain his position only to be indifferent towards the situations that colonial militia are dealing with. Steven Waddington is fantastic as Major Duncan Heyward as an officer who is hoping to marry Cora as a man trying to protect them as well as maintain his own position in rank while dealing with the chaos of the ambush from the Huron. 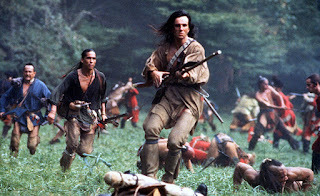 Russell Means and Eric Schweig are brilliant in their respective roles as the father-son duo of Chingachgook and Uncas as two Mohican warriors who are family to Hawkeye as they help the Munro sisters find safety with the former being a master warrior while the latter becomes a source of comfort for Alice. Jodhi May is excellent as Alice Munro as Cora’s younger sister who is dealing with the ambush and terror of war where she befriends Uncas whom she becomes close to. Wes Studi is amazing as Magua as a Huron warrior who harbors deep hatred towards Colonel Munro as he is revealed to be a double-agent for the French where he is hoping to get his revenge and bring honor back to his tribe. Madeleine Stowe is incredible as Cora Munro as a woman who deals with the ambush and situation that she and her sister are encountering while getting an understanding about Hawkeye and what she sees as she would gain a completely different perspective from what her father sees about what is really happening in the war. Finally, there’s Daniel Day-Lewis in a phenomenal performance as Nathaniel Poe/Hawkeye as a white man raised by the Mohicans since he was a boy as he is someone that knows what is happening as he is doing what he can to protect the Munro sisters while falling for Cora as it’s a charismatic and thrilling performance from Day-Lewis who proves he can be tough and heroic. The Last of the Mohicans is a tremendous film from Michael Mann that features a great performance from Daniel Day-Lewis. Along with its ensemble cast, Dante Spinotti’s gorgeous cinematography, its immense music score, beautiful locations, and themes of war and honor. It’s a film that play into a group of people caught up in a deadly conflict as well as see things that would complicate the ideas of war forcing them to survive and evade the horrors of war. In the end, The Last of the Mohicans is a magnificent film from Michael Mann. I watched this when I was too young to appreciate it and I didn't have enough good feelings to ever go back to it. Maybe I should reconsider. I've never sat down and watched this and I feel kind of bad about it. Some day. The final scene that has no dialogue is truly brilliant. So many directors try to recreate this concept and fail. @Jay-I was probably one of those when I first saw it on TV when I was 12 years old and thought it was pretty good. It ended up being better than I thought it would be as the years gone by and through re-watches. I think it's time to revisit that film. @Brittani-See it. It's not like a lot of war films yet it's really more of a genre-bending film. @Courtney-Indeed. This is why I love Michael Mann so much. Only he could do that and do it right. I wish he would go back to 35mm filmmaking instead of emphasizing on digital video. @keith71_98-Damn... that is good music to have played at a wedding. It is one of the best films ever made in my opinion as well. I hadn't seen it in its entirety in years and wow, it still has this offers something new.